The latest installment in a theme I’ve been iterating on for a while now: The Decline of Intel. Intel’s strategic position has been eroding since 3DFx came along 15 years ago. From that point on, every PC sold included a bunch of transistors that were paying off the amortization on someone else’s big fab investment. Intel is finally clawing some of that territory back, but I have my doubts that it is going to be enough. The bottom line is that Intel’s competitive position depends in its ability to invest ahead of competitors in next gen fab technology. It can afford to do so because of its dominant position in desktop and server CPUs and the healthy margins that brings. The problem for Intel is that each new fab generation is more expensive than the last, and doubles the number of transistors they can produce. Together, this more than doubles the number of transistors they have to sell to maintain their margins. History suggests that this has been a long term challenge. Their average selling price has declined over the last decade in order to balance the supply/demand equation. They’ve been clever about maximizing their ROI. They use lower margin CPUs to keep the latest generation fabs full, underwriting the cost of fabbing their higher-margin server CPUs. They maximizing the productive life of their older fabs by using them to build support chips (this is why Intel made incursions with x86 chipset makers in the mid-2000s). Unfortunately, this model has its own limits. One of the ways they’ve been managing to schlep transistors is by integrating more and more features directly onto the CPU die, but by doing so, they undermine their own support chip business, cutting in to opportunities to continue to extract revenue from their older fabs. Which brings us to mobile. Mobile devices can drive a lot of volume, but they don’t drive a lot of revenue. Apple’s new A6 SoC is roughly the same size of one of Intel’s low end i3 CPUs, but intel sells the i3 for 5-10x what Apple, or any other mobile vendor, is likely to pay for a cutting edge ARM SoC. It appears that Intel may finally have achieved the power/performance ratio needed to play in mobile phones, but it will probably be at least another year before they even have a chance of having design wins that pay-off in significant volume. And even if they do, their growth is limited. Samsung is a major player in phones, and they tend to favor their own SoCs. Apple is the other big player, and they have obviously made their own bet. That leaves Qualcomm’s market share for Intel. I expect that will be a tough fight. Qualcomm will integrate the SoC with the baseband, and they have a lot of patents to bring to that fight. And then there are all these ARM licensees. It is crazy looking at the evolution of ARM SoCs going into cheap Chinese Android tablets. I just don’t see a big opportunity for Intel. They have a narrow window to gain any sort of real foothold, and the territory they can gain is unlikely to be enough to hold back the tide of ARM licensees which will start eating into their server revenue. Intel is vertically integrated around the design, fabrication and marketing of CPUs and related components. The advantages of that strategy are in decline. For chips, that seems to be giving way to merchant fabs, which can get the best ROI on their fab investment by leaving the design and marketing of chips to other companies, like Apple, who are vertically integrated around their end-user, and for whom designing their own SoC allows them best serve their customers and drive economies of scale. This entry was posted in apple and tagged apple, intel, soc on October 23, 2012 by eas. Bottom line, I think the financial industry is cancer, a useful part of our economy that has outgrown its utility to the degree that it inflicts pain and threatens the vitality of society as a whole. Based on some conversations with friends who know the industry intimately, I’ve formed the opinion that our only hope is to box in the big banks and create room for alternatives to emerge and thrive. It is from this point of view that prepaid debit, particularly a new card called Bluebird, from Wallmart and Amex, interests me. Bluebird, like many other prepaid debit cards, tend to target people in compromised financial positions who can’t afford a normal checking account. Financial services targeted at this sector are often exploitive, because the customers have few options. I have many complaints against Wallmart, but they’ve managed to thrive by offering their customers low prices, and the Bluebird card appears to follow the same pattern by offering customers a better deal than competing offerings. I hope this is a situation where Wallmart can do well by doing good. This entry was posted in General on October 14, 2012 by eas. New York Times Misunderstands Maps App Situation. A few days ago, the makers of Snappli, an Android and iPhone app that is supposed to reduce and secure your mobile phone data usage though they’d get some free press by jumping on the iOS 6 Map.app-bashing bandwagon. Before iOS 6 1 in 4 people were using Google maps at least once a day. After iOS 6: 1 in 25 using Apple maps and falling. Damning, right? Well, not so fast. People have pointed out that iOS maps use much less data. Snappli answers that they weren’t looking at overall Maps data usage, they were looking at actual use of the app. Of course, that’s probably not quite true. There is very little an iOS App can see about usage of other apps. Snappli can see more than others though, because it intercepts network traffic on the phone. It shouldn’t be able to see which app is accessing the network, but based on the remote hosts being accessed is accessing, they should be able to make guesses about what application is being used. There are a few factors that call into question the accuracy of their guesses though. First, since the Map.app is a relatively new application, and they were likely in a hurry to take advantage of the bad press surrounding some of its shortcomings they might not have a complete picture of all the remote hosts it accesses over days of use, so they might be missing traffic that indicates use of the Map.app. Second, and more importantly, the new version of the Map.app doesn’t just use less data when talking to remote servers, it has to requires it less often, much less often. 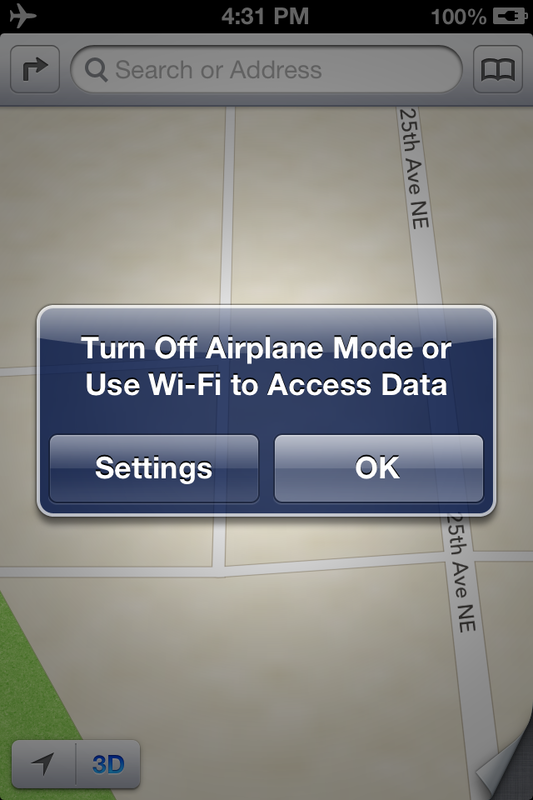 To demonstrate, I put my iPhone in airplane mode, which cuts it off from any Internet access. Next I launched the iOS 6 Map application. I got a warning that I needed to turn on the network to use Maps, but when I dismissed that warning, I could see a map of the area near my home, where I last used the app. When I zoomed out, I could still see a map, so I zoomed out even further until I could see the limits of the cached data. 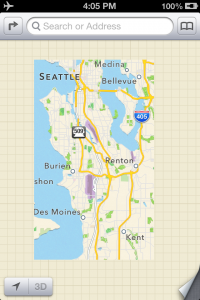 iOS 6 had cached data for more than one hundred square miles around Seattle. 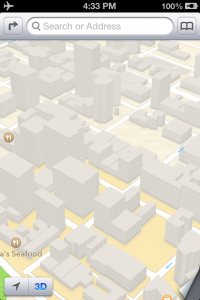 The screenshot below shows that it has even cached building-level detail for parts of Seattle I haven’t even been within a mile or more of since upgrading to iOS 6. Snappli’s data tells a very different story if you take this behavior into account. Most people cover the same territory in a typical day, or week. 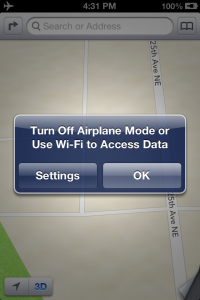 If they use the iOS 6 apps a few times, it is likely to cache a significant amount of the map data they need, it is only when they leave that beaten path, or do a text search for a location that the Map app will have to connect to a server on the Internet. If we assume that after upgrading to iOS 6 and checking out the new maps the average iPhone users go back to using the app once every four days, then Snappli’s data suggests that they only do a text search, or need new map data once every six uses of the app. That doesn’t seem unreasonable, does it? We don’t really have enough information to know for sure what is going on, but it does seem likely that Snappli’s data supports the idea that people are using iOS 6 maps just as much as they used iOS 5 maps as it does to support, while, on the other hand, it is likely that their interpretation severely overexaggerates a decline in usage, if such a decline does indeed exist. Unfortunately, Kevin Tofel of GigaOm, while acknowledging some of the criticisms of Snappli’s data is uncritical in accepting the company’s defense of their methodology. Kevin, here is the thing, the data may “seem legit,” but the interpretation is bogus, because it doesn’t take into consideration, or even acknowledge, that there are alternative interpretations that might also explain the observed behavior. This entry was posted in apple and tagged iOS 5, Map.app, maps on October 3, 2012 by eas.